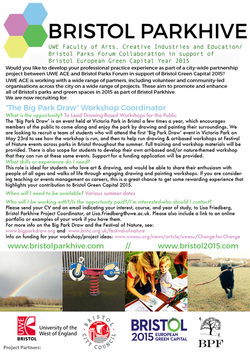 The ‘Big Park Draw’ is an event held at Victoria Park in Bristol a few times a year, which encourages members of the public young and old to come along and enjoy the park by drawing and painting their surroundings. Given Bristol’s award of European Green Capital 2015, there is an increase in activity around parks and green spaces to encourage more of the public to get involved in building on Bristol’s green success. 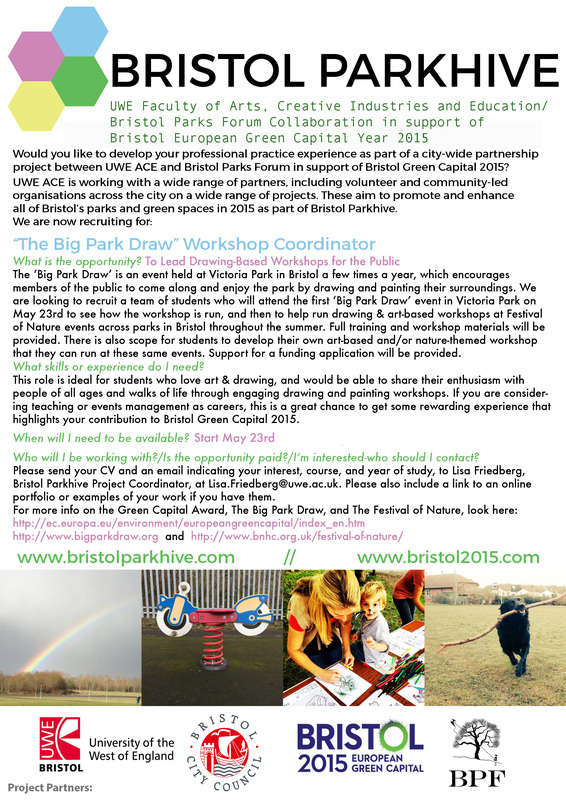 We are looking to recruit a team of students who will attend the first ‘Big Park Draw’ event in Victoria Park on May 23rd to understand how the workshop is run, and then to help run drawing & art-based workshops at Festival of Nature events across parks in Bristol throughout the summer. Full training and workshop materials will be provided. There is also scope for students to develop their own art-based and/or nature-themed workshop that they can run at these same events. Support for a funding application will be provided. Suited for: This role is ideal for students who love art and drawing, and would be able to share their enthusiasm with people of all ages and walks of life through engaging drawing and painting workshops. If you are considering teaching or events management as careers, this is a great chance to get some rewarding experience that highlights your contribution to Bristol Green Capital 2015. Please send your CV and an email indicating your interest, course, and year of study to Lisa Friedberg, Bristol Parkhive Project Coordinator, at Lisa.Friedberg@uwe.ac.uk. Please also include a link to an online portfolio or examples of your work if you have them.